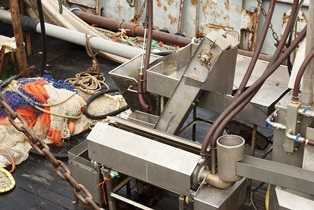 Modern fishing vessels utilize conveyor belts to quickly and efficiently process their catches. Conveyor belts are great for productivity, but they can endanger maritime workers due to employer negligence. Inadequate guarding. Machinery at the end of conveyor belts should be equipped with guarding rails to prevent injury. Some conveyor belts merely have waist-high handrails, allowing a worker to come into contact with the belt. Burns, scrapes, cuts, and bone fractures are frequently the result. Improper training. Maritime employers should ensure that workers are properly trained in the use of conveyor belts. Lack of training may result in workers wearing loose clothing that gets caught in the conveyor belt, reaching for objects on the belt by hand, or trying to free up caught objects while the belt is still moving. These accidents can lead to severe hand and arm injuries, including lost limbs and amputations. Inadequate or improper maintenance. Parts that are broken or improperly installed can cause conveyor belt injuries when a maritime employer fails to ensure all components are in working order. Faulty or exposed wiring puts workers at risk for electrocution, which may cause burn injuries and cardiac arrest. Maintenance workers may also be injured when their limbs are caught between moving parts, resulting in amputations and broken bones. Improperly secured conveyor belts. Heavy objects can fall from unsecured or overloaded conveyor belts. Workers struck by objects may experience spinal cord injuries, lacerations, and traumatic brain injuries. Maritime workers are entitled to a safe working environment, with properly-maintained equipment aboard a seaworthy vessel. If you’ve been hurt in a maritime conveyor belt accident, you’re entitled to compensation for medical bills and lost income.